Boom Netting is a must! 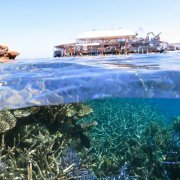 Passions of Paradise visits two unique outer reef locations on the Great Barrier Reef. Snorkel, dive, sunbathe, or chill out on the boat. The sleek, modern catamaran will ensure you travel in style and comfort without the large crowds. 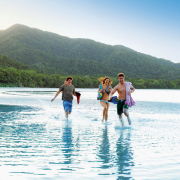 No visit to Cairns would be complete without a trip to the Great Barrier Reef. Cairns is the gateway to this remarkable natural attraction, and one of the most highly visited regions of the Great Barrier Reef World Heritage Area due to its close proximity to spectacular outer edge reefs, the beautiful coral cays, idyllic tropical islands and the multitude of tourism experiences that are on offer. From half day trips to full day multi-adventures, amazing diving experiences to relaxed island getaways, swimmers/non-swimmers, young and old, there are opportunities for everyone to marvel at the magnificence of the Great Barrier Reef. The Great Barrier Reef is so accessible with many sections rising in rich, colourful beauty to just a few metres below the surface. 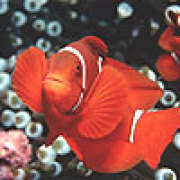 The tropical waters and protected reefs provide perfect conditions to novice snorkellers. Snorkelling is great fun, easy to learn and accessible to anyone young or old - it's an enjoyable way to get the whole family involved! Snorkelling requires no special training, only the ability to swim and to breathe through the snorkel. 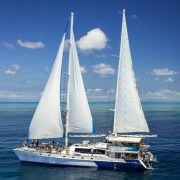 Equipment is provided onboard your reef cruise with most day trips offering full instruction and an included guided tour. You don't have to swim too far to view the coral as in most cases the reef is right there as soon as you push off into the water. Sometimes large resting buoys are placed short distances from each other so you can snorkel from float to float and rest when you need to. Or if you are still a little apprehensive some companies offer life jackets and 'noodle' floats designed to give you extra buoyancy, and all you have to do is kick and gaze at the underwater world. You will witness just as much snorkelling as you would scuba diving, with spectacular shallow coral gardens hiding just under the surface. 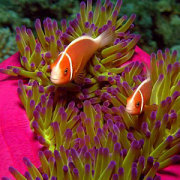 Scuba Diving offers an awesome oppotunity to explore further into an underwater world teeming with exotic marinelife, bommies, coral canyons, walls and much more. From the novice to the most experienced diver, there are reef trips that will accommodate your level of experience. 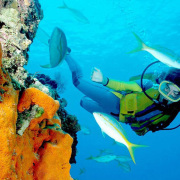 Choose from a one day outer reef adventure or take part in an extended dive expedition. Introductory Diving is suitable for beginners and requires no previous scuba experience. Conducted in small groups under the supervision of an experienced Dive Instructor, introductory diving gives beginners an unforgettable Great Barrier Reef experience without having to complete a full scuba diving course. The only requirements are that you are over 12 years, pass the on-board medical questionnaire and participate in a 30 minute dive brief. A highly skilled dive instructor will take you step by step through the whole experience, from the dive briefing lecture, the equipment and the dive, to ensure a safe, comfortable and memorable experience. Your dive experience will generally last around 30 minutes underwater and on completion you will receive a certificate as a memento of your underwater adventure. Certified Divers will be excited by the range of experiences and magnificent Great Barrier Reef locations to choose from, no two dives are ever the same. Drift and wall dives, bommie and pinnacle, coral gardens and swim throughs are just some of the amazing experiences to expect. 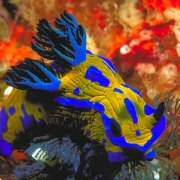 The outer reefs are great for beginner divers. The maximum depth is generally 20 metres. 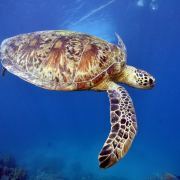 Some of the best dives on the Great Barrier Reef are in less then 18 metres of water. 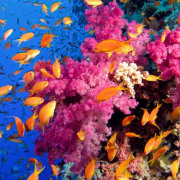 This tends to be where the reef is at its most colourful and full of life. Most day trips offer the opportunity to explore up to 3 reef locations in a day, each site offers a new experience, selected for its unique variety of marine life and corals. Certified dives last approximately 40 minutes or more. 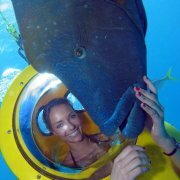 For experienced divers a live aboard trip to the Cod Hole and Coral Sea is a must. The Cod Hole lies at the top of the Ribbon Reefs, and is home to a family of resident Potato Cod (Groper). 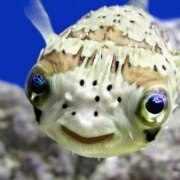 These diver friendly fish will amaze you with their sheer size and seeming eagerness to pose for camera. 120 miles offshore lies isolated reef systems and crystal clear waters of Australia's Coral Sea. Here 3,000 ft walls emerge from the ocean depths and the water is so astoundingly clear that divers appear suspended in air. Water temperatures range from 22 to 28 degrees celsius, allowing comfortable diving all year round. A pontoon is a large stable platform situated at the reef, where a whole multitude of reef activities and adventures take place from. Pontoon based reef trips are ideal for swimmers and non-swimmers, families with young children and people prone to sea sickness. Families love them because they're roomy, there's handy facilities onboard, and there are many activities to keep the kids amused for hours. They provide comfort and stability for all weather and wind conditions. 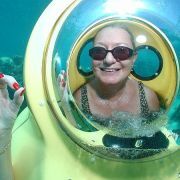 There are many activites for young and old including semi submersible tours, glass bottom boat tours, introductory diving, sea walker helmet diving, helicopter flights and more. All pontoons feature an underwater observatory built into the structure, which is a little like being in an aquarium but seeing the fish and coral in their natural habitat. Younger children will love the kids swim area which is fully enclosed and safe. 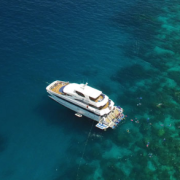 Snorkel platforms provide easy entry into the water, and with fish and corals located directly below, you don't need to swim too far to experience the Great Barrier Reef. 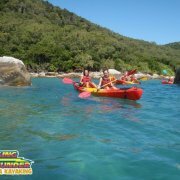 All equipment is supplied including lifevests and floatation devices, there are also snorkel rest stations so you can hold on, rest and enjoy the magic of the underwater world. 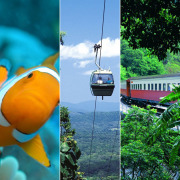 Cairns is the closest gateway to the Great Barrier Reef and fast catamarans make it even more accessible with travel time on average taking just 90 minutes to the most northern outer edge. Faster travel time allows you to maximise your day with more time for snorkelling and diving. 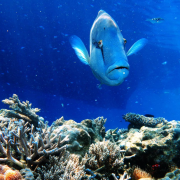 Most Outer Great Barrier Reef tour operators visit two or more reef locations and all water activities take place directly from the boat, either snorkeling or scuba diving. Reef locations are selected on the day according to weather conditions, to provide passengers with the upmost comfort, and best experiences in terms of visual impact, ecological diversity and the challenge of discovery. All equipment and lunch is provided. 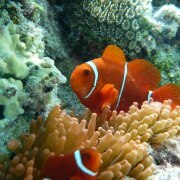 To learn more about the marine life around you, make sure you join a guided snorkel tour. As coral relies on sunlight for growth, some of the best snorkelling is in the shallow areas around the reef top. Your marine interpreter will guide you over shallow coral gardens, pointing out fish and marine life, corals and areas of interest along the way. Take life at a slower pace on a luxury sailing cruise. 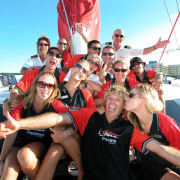 Reef sailing cruises allow for plenty of in water activities as well as time for relaxation. Passenger numbers range from 20 up to 150 depending on the trip you choose. 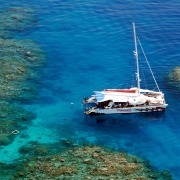 Generally the inner reefs and islands are visited on the day cruises that make for a calm and comfortable experience. Strong winds mean exciting performance and less travelling time, calm winds mean a spacious comfortable platform to soak up the sun. Many trips limit their daily guests to ensure a personalised and unforgettable Great Barrier Reef experience, with maximum comfort and space. Destinations visited include Michaelmas and Upolu Cay, Green Island and other inner reef areas. 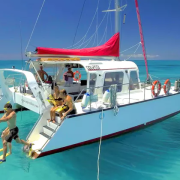 Ocean Free is Cairns' only sailing tour to offer a reef and island destination in a day, visiting their exclusive reef mooring at Green Island. Reef Daytripper is the smallest sailing operator taking just 20 passengers, which would normally only be available on a privately owned yacht. 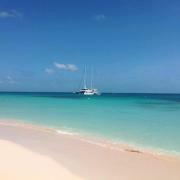 Meanwhile Ocean Spirit Cruises and Passions of Paradise offer trips to Michaelmas Cay, an exclusive reef location. The cay is a protected seabird sanctuary and plays host to over 20,000 migratory seabirds - one of the most important nesting sites in the Southern Hemisphere. To really get a complete grasp of the sheer magnitude of the Great Barrier Reef, there's only one way to see it and that’s by helicopter. Excursions include anything from a 10 minute scenic flight from an outer reef pontoon, to a 30 minute or 60 minute reef and rainforest spectacular. 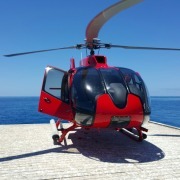 You can even combine a heli flight with an outer reef cruise and view the reef from above and below in a day! A ten minute heli flight whilst at the Great Barrier Reef is exciting, you will find yourself immediately immersed in the wonderful sights that appear in every direction as soon as you take off and climb up and away. Island day trips provide a one-stop tropical experience. 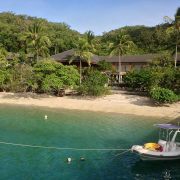 With the convenience of being just a shot 45 minute ferry journey, you can spend the day snorkelling the fringing coral reefs, strolling through National Park rainforest walking tracks, sea kayaking, scuba diving or simply just relaxing on a sandy beach. Green Island is an easy day trip from Cairns and offers the flexibility of frequent ferry transfers, perfect for visitors with limited time. Once on the island the day is yours to do as much or as little as you please. With a range of optional activities, you can tailor the day to suit your own requirements. In comparison Fitzroy Island National Park features a rugged, diverse landscape of granite outcrops, open woodlands, rainforest, mangroves and coral beaches. 97 percent of the four square kilometre continental island is National Park, covered in tropical rainforest. 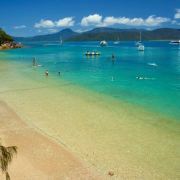 Laid back and low key, Fitzroy Island is loved by the locals and visitors alike. It is a destination to enjoy in relaxed simplicity. 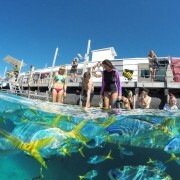 Glass Bottom Boat tours are perfect for those who want to experience the reef without getting wet. 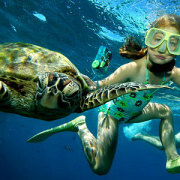 Ideal for non-swimmers, families with young children and those who would like to see the reef from another perspective. It does provide a similar experience to snorkelling as you hover over beautiful coral gardens, giant clams, and schools of colourful reef fish. 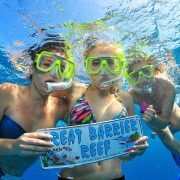 Glass bottom boat tours are fully guided to give you the best reef experience. 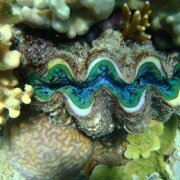 Common things you’ll see are sea turtles, star fish, giant clams, hard and soft varieties of coral, small reef sharks, and all manner of strange and exotic creatures. Semi Submersible Tours allow you to get close to the action without getting wet. They are ideal for the non-swimmer. Semi submersible tours cruise slowly through the colourful coral gardens giving passengers, seated just one metre underwater, the opportunity to experience a snorkellers-eye view of the marine life without getting wet. Through large viewing windows you are able to view the spectacular coral formations and the masses of brilliantly coloured fish. 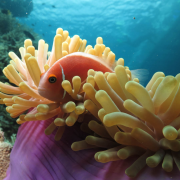 The semi-sub experience takes approximately 25 minutes and generally includes an informed commentary on the marine life observed during the journey by a marine naturalist, and an overview of the wonders of the Great Barrier Reef. The Seawalker helmet "dive" has been designed to introduce people to the excitement of the underwater world, even without any prior dive knowledge or experience.Breathing fresh air delivered from the surface into your helmet, you will walk underwater bringing you up close and personal with some of the animals that make the Great Barrier Reef so special. This activity is a great options for non-swimmers, children or older people not sure about trying scuba diving or snorkelling. It can even be a great experience for people with minor disabilities. You do need to pass a small medical questionnaire to be able to participate and some medical restrictions apply. The minimum age is 12 years. Unlike traditional scuba diving, Seawalker enables you to breathe through your nose and mouth as you would above water. 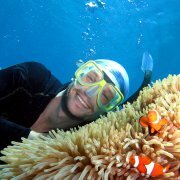 Seawalker also allows you to keep your face and hair dry, you can even wear glasses or contact lenses while you experience the wonders of the Great Barrier Reef with your Seawalker Guide. Visiting the reef for the day is an exciting excursion for kids, and in turn very rewarding for parents to watch their children interact and gain knowledge of this truly educational experience. Pontoon based reef trips are ideal for families with young children, there are many activities to choose from to keep the kids amused for hours. Families with older children however will love the Outer Reef as the snorkelling is fantastic and the variety of marine life is unsurpassed. You can also expect all islands and cays to have ample facilities for children, lots of sand to play with and in some cases an abundance of extra activities and attractions. 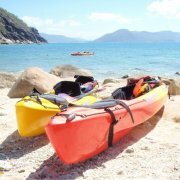 Green Island is an easy day trip from Cairns and offers the flexibility of frequent ferry transfers. Once on the island the day is yours to do as much or as little as you please. 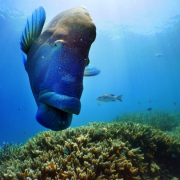 Having a disability does not restrict access or experiences of the Great Barrier Reef. There are many cruises that can cater for people with limited mobility. The best option is to take a pontoon trip. Generally the catamarans that travel to an outer reef pontoon are larger with wider aisles, have a designated seating area, ramp facilities from vessel to platform, and a wheelchair access toilet. Access to the water, coral viewing vessels, underwater observatory and sundeck may require stairs to be negotiated and a carer to be present. The snorkelling platforms are situated right on the waterline and there are bench seats on the snorkelling platform where you can put on your fins, mask and snorkel before entering the water. For guests confined to a wheelchair, a specially designed water powered lift allows for easy access into the snorkel pool. It is recommended to call and talk through the level of disability so that we can suggest suitability.